It took a while to concoct the perfect gluten free stuffing for this years turkey but after much trial and error we ended up with what we think is the perfect gluten free recipe, it has a prep time of around 20 minutes and a cooking time of 30 minutes and you can have every confidence that it will impress your guests. 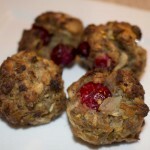 This recipe will make around 20-25 stuffing balls, of course you can halve the mixture if you require less. Blend the pistachio nuts in a blender for 30 seconds, a few chunks of pistachio nuts go well with this stuffing. Add the breadcrumbs/onion mixture to the sausage mix and blend well with yor hands..